The start of the 2019 Bahrain Grand Prix. 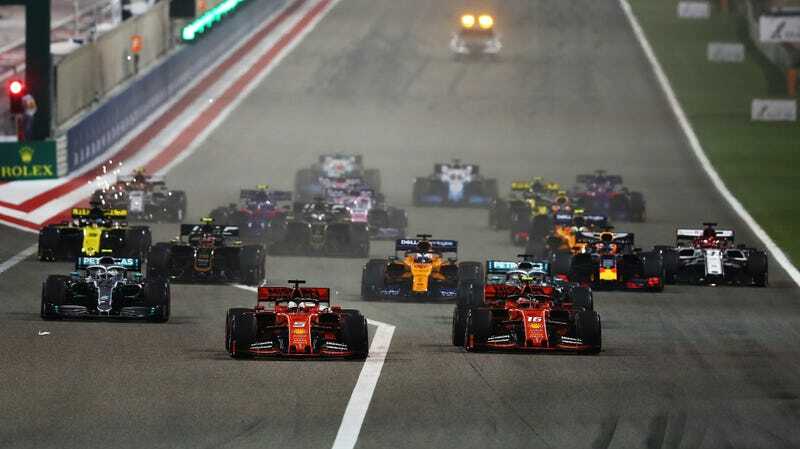 In terms of racing, Formula One couldn’t have asked for more out of this year’s Bahrain Grand Prix—hard racing, contact, spins in the middle of the field and at the front of it, and a winner no one expected come Sunday. All of it happened in front of a record U.S. television audience, too, according to ESPN. ESPN announced the record Tuesday, saying an average of 711,000 viewers watched the ESPN2 telecast Sunday. The announcement said that made it the largest U.S. television audience on record for Bahrain, which started at 11 a.m. ET, and that it was the second-largest U.S. cable audience for an F1 race on record. The only telecast to beat it, the announcement said, was the Monaco Grand Prix on ESPN last year, which had an average of 820,000 at 8 a.m. ET. The number from Sunday is also up from an average of 692,000 viewers for the Bahrain race on the same channel last year, according to ESPN, and up from the 413,000 who watched on CNBC in 2017. The slight jump in viewership comes not long after the Netflix series on F1, Drive to Survive, came out, but it’s hard to say whether any of that is related. Not only were the numbers from the Bahrain telecast up this year, but ESPN’s announcement said viewership of the season-opening Australian Grand Prix was up as well—from 175,000 watching on ESPN2 in 2018 to 659,000 this year. A 277-percent audience increase for an event that started at 1 a.m. ET isn’t terrible. Higher viewership is always good, but those numbers are nothing to put on a T-shirt when compared to numbers for series like NASCAR and IndyCar. NASCAR viewership remains in the millions despite precipitously dropping ratings, while the average number of viewers for the 12 IndyCar races in 2017 was 507,000. Those series have an edge in the U.S. in that they run here, and their race times correspond with times when U.S. viewers are typically awake—something that’s not always the case in F1, which has a worldwide audience. But let us not forget that F1 running a grand prix in Bahrain is one of the last things we should celebrate, good viewership in the U.S. or not.